Conditional branching may very much depend on the outcome of a boolean query. in this section we describe all such types of queries as well as the different ways to process boolean values. Description: This operator tests whether two expressions evaluate to the same value. The result of this operator is either true or false. Description: This operator tests whether two expressions do not evaluate to the same value. The result of this operator is either true or false. It is the logical negation of <expr1> == <expr2>. Description: This operator tests whether the expression <expr1> is greater than the expression <expr2>. It returns a <bool> value. The comparison is available only for two situations: If both expressions are real numbers, then the order of size is the usual ordering of real numbers. If both expressions are strings, then the order is the lexicographic (dictionary) order. In all other cases (if the values are not comparable) the value ____ is returned. Description: This operator is similar to > but tests for less than. Description: This operator is similar to > but tests for greater than or equal to. Description: This operator is similar to > but tests for less than or equal to. Description: CindyScript provides a fuzzy variant for each comparison operator. This version tests whether the condition is satisfied up to an epsilon bound. Thus the test a~=0 tests whether is the variable a lies between +epsilon and -epsilon. The small value epsilon is set to 0.0000000001. This operator is sometimes very useful to circumvent inaccuracies which are unavoidable in purely numerical calculations. The exact semantics of the exact and the fuzzy operators can be read off from the following diagram. 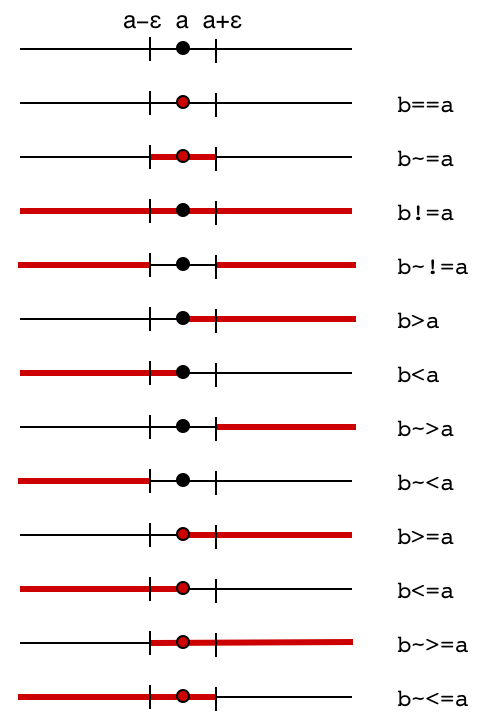 Here for each operator the picture shows for which region of b (marked in red) the operator evaluates to true. If one of the two arguments is not a Boolean expression, the operator returns ___. If the argument is not a Boolean expression, the operator returns ____. Description: and(x,y) is equivalent to x & y. Description: or(x,y) is equivalent to x % y. Description: not(x) is equivalent to !x. The following predicates test whether the expression <expr> belongs to a certain class of objects. The predicates are important in defining functions whose behavior depends on the type of input expressions. Furthermore, these arguments are very useful for debugging, since they can be used to test assertions on the typing of the values in a program. Description: This operator tests whether the expression <expr> is an integer. Description: This operator tests whether the expression <expr> is a real number. Note that integers are also real numbers. Description: This operator tests whether the expression <expr> is a complex number. Note that real numbers are also complex numbers. Description: This operator tests whether the expression <expr> is an even integer. Description: This operator tests whether the expression <expr> is an odd integer. Description: This operator tests whether the expression <expr> is a list. Description: This operator tests whether the expression <expr> has the shape of a matrix. This means that the entries of the list are themselves lists, all of equal length. If there are n entries each of length m the expression represents an n × m matrix. Description: This operator tests whether the expression <expr> is a list all of whose entries are numbers (integer, real, or complex). Description: This operator tests whether the expression <expr> is a matrix all of whose entries are numbers (integer, real, or complex). Description: This operator tests whether the expression <expr> is a string. Description: This operator tests whether the expression <expr> represents a geometric element. Description: This operator tests whether the expression <expr> represents a geometric element and is selected. For a geometric element you can also use the .selected property to check this. Description: This operator tests whether the expression <expr> represents a geometric point. Description: This operator tests whether the expression <expr> represents a geometric line. Description: This operator tests whether the expression <expr> represents a geometric circle. Description: This operator tests whether the expression <expr> represents a geometric conic. Description: This operator tests whether the expression <expr> represents a CindyLab mass. Description: This operator tests whether the expression <expr> represents a CindyLab sun. Description: This operator tests whether the expression <expr> represents a CindyLab spring. Description: This operator tests whether the expression <expr> returns an undefined element (___). Contributors to this page: von Gagern , Lembach and Kortenkamp . Page last modified on Monday 09 of February, 2015 [19:37:16 UTC] by von Gagern.